What day is it again today? Western timings have lost their meaning out here in the desert. 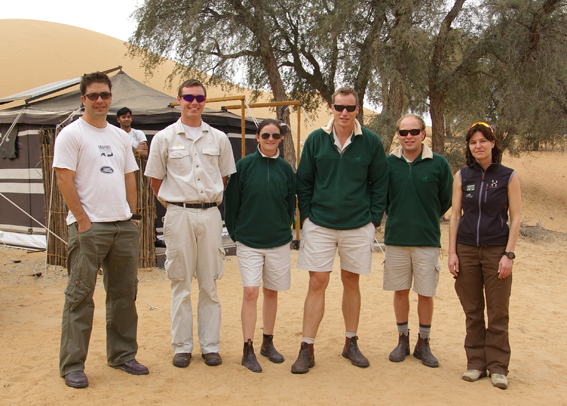 It is day four of our expedition and everyone has passed an intensive training regime on the research equipment, data sheets and dune driving. 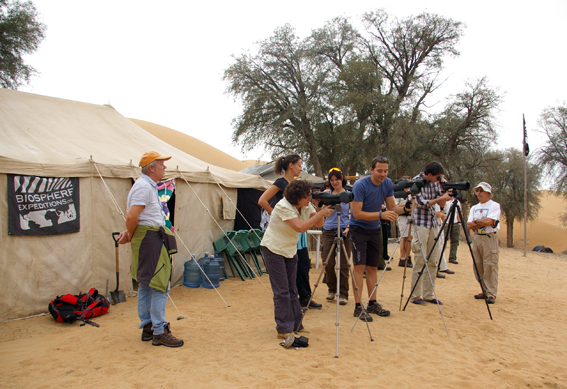 Apart from the Biosphere Expeditions participants, a number of rangers from our partner Al Maha resort also attended our training sessions to get an insight into conservation work on Sunday. 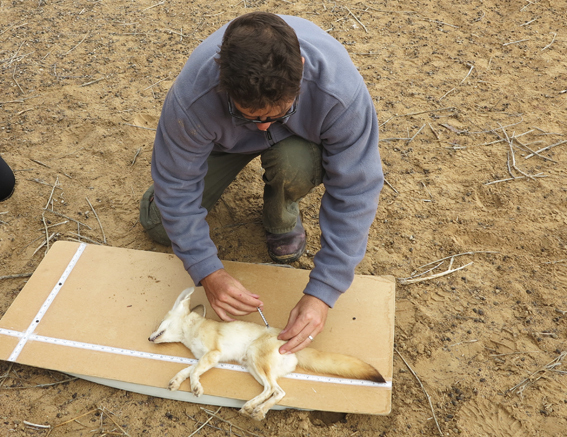 On Monday, we set ten live and nine camera traps, started the health assessment of Arabian oryx through body condition scoring and our vegetation survey of the DDCR within our 2×2 km quadrants. Tuesday we hit the jackpot, a lucky day not only for our scientist Steve. Why? 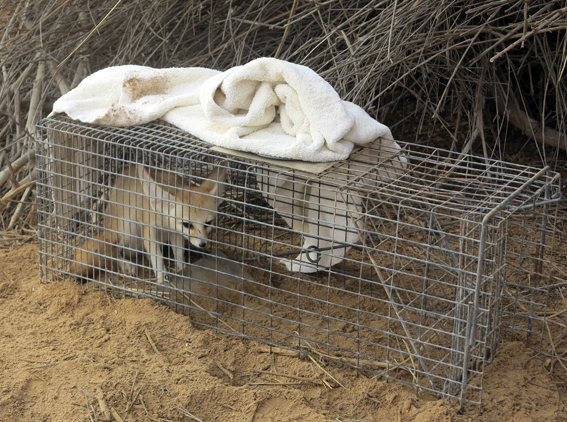 Because we caught a sand fox in one of the traps! These tiny big-eared foxes are one of the rarest species in the area. A maximum number of twenty are estimated to be present inside the Dubai Desert Conservation reserve, an area of 227 square kilometres! Its mass is no more than 2 kg. We captured an adult male of 2+ years. Tricia, Branko, Yvonne and Martin were the lucky team members attending the procedure of sedating, measuring and micro-chipping him. Everyone has settled well into base camp, experienced refreshing showers in the afternoon, freshly cooked vegetarian dishes for dinner and early breakfast at 6:00. Work starts as the sun rises at around 7:00. The weather has improved and there has been no rain for the last couple of days. 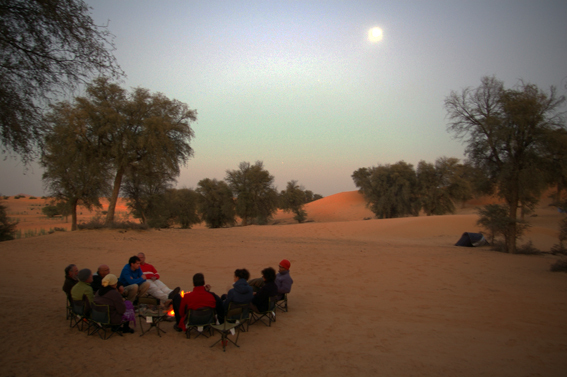 But after the rain, the desert is bathed in oranges and reds at sunset and the dunes reveal their full beauty in the early morning hours shortly after sunrise. It’s a magical place we are working in!